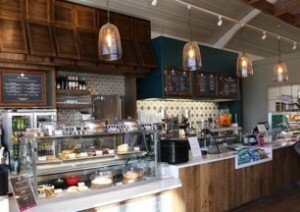 Squire’s Garden Centre in Shepperton has opened a stunning new Café Bar. It has stylish new decor and there are now distinct seating areas to choose from, including the main Café Bar, a sophisticated afternoon tea area with piano, a coffee lounge with relaxing sofas, plus a special family-friendly area. There’s also a delicious new menu and a new style of service – where you order at the till then take an electronic tracker to your table, enabling customers to relax and enjoy speedy waiter service. Squire’s are inviting everyone to come along to a special “Prepare For Christmas” shopping evening on Friday 20th October at 5-8pm. You can be one of the first to see their stylish new Café Bar and their Christmas shop, and you’ll get an exclusive 20% off all decorations and Christmas trees on the night. It’s a great chance to get organised and inspired for Christmas, plus you’ll receive a complimentary glass of wine or soft drink on arrival! There will be free festive demonstrations throughout the evening, including how to make your own Christmas cards, gift bags, and children’s decorations, a Christmas pudding demo, and advice on how to make a Christmas centrepiece and a winter planter. Partake in some complimentary beer and food tasting, get gift ideas from specialist home fragrance company Ashleigh & Burwood, and listen to live music with pianist Derek Webber. There will also be guidance on planting bulbs for winter colour, feeding wild birds, and buying artificial and real Christmas trees. Plus if that wasn’t enough you can enjoy a delicious curry buffet in Squire’s stunning new Café Bar! For just £9.95 per adult and £7.95 per child you can tuck into Chicken Korma, Beef Balti, Penang Curry (Vegan & Gluten Free) and Sweet Potato, Spinach & Lentil Dhal (Vegan), all served with a selection of poppadoms, naan bread and pilau rice. There’s no need to book, simply turn up on the night. Squire’s Garden Centre, Upper Haliford Road, Shepperton, TW17 8SG.